It’s time to make a moonbeast! Aberrations play a big role in the history of Canus, the Material Plane of my Exploration Age campaign setting. They are the main villains in one of my home campaigns at the moment. That group is currently 16th level. The highest level challenge rating aberration in the Monster Manual is 14 (beholder in its lair). The highest level non-legendary aberration is the challenge 10 death slaad. While throwing a pile of nothics at the PCs can be fun, it gets to be a grind after a time. In fact there’s only 19 aberration stat blocks in the entire fifth edition Monster Manual. At this point my players have fought them all many times over. Even in groups they’re becoming less of a challenge so I need to make some new high CR aberrations. I’ve made the Star Wars-inspired gaping maw, but I need some others. Aberrations came to Canus long ago from the Far Realm. They found the new world was full of resources and as of yet uninhabited by intelligent life. These alien creatures ruled over the world until the dragons awoke from beneath the surface of Canus. No one knows if the dragons lived on the surface of Canus for years and then retreated below to sleep or if they were simply born of the core of the world. Their climb through the earth created the tunnels of the Underground and their spilled blood became the elf races. When the dragons reached the surface, the authority of aberrations enraged them. The aberrations thought no better of the dragons. All out war was inevitable. The dragons used their magic to destroy any connection Canus had to the home plane of the aberrations. Those that were on Canus could not call for reinforcements. The Far Realm remains out of reach to this day. During this time of violence, the dragons created intelligent races to aid them in their battles. New humanoids were created and began to walk the earth. The war decimated both sides. In the end, the defeated aberrations retreated to the Underground while the dragons retreated to their various lairs, weary from millennia of fighting. The humanoids inherited the broken world and began to rebuild. Dragons lost the desire to rule through the scars of battle but their foes are a different story. Aberrations believe this world is rightfully theirs and was taken unjustly. Now it belongs to the inferior humanoids. They want Canus back. They’re ready to reclaim it. 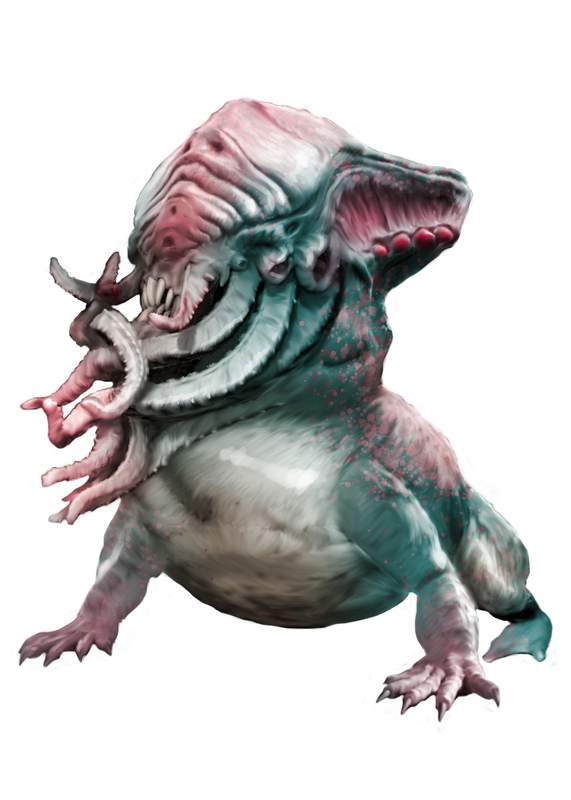 It’s clear that I need some more aberrations to really make my campaign and world complete, especially since this creature type has such a rich history in Exploration Age. Around the same time I was thinking I wanted to make more aberrations, a product called Publisher’s Choice Lovecraftian Horrors Subscription went on sale at RPGNow. Since I’ve been creating more products I need a steady supply of good art and Fat Goblin Games has some of the best. They’re constantly adding baddies to this product. If you’re a creator who needs art, check it out! For me it is worth the investment. No one is paying me or even asking me to say that. Just my luck this little thing was on sale at the time I needed it! H.P. Lovecraft’s imagination has spawned so many wonderful otherworldly creatures. Many of those creatures clearly inspire D&D’s aberrations. Mind flayers are basically mini Cthulhus! I decided to convert a few of these beasties into fifth edition D&D rules for Exploration Age. I’m going to make their stories my own, but the names and forms of the beasts shall remain the same! Behold the first of these terrors, the moonbeast! The eyeless, greyish-scaled form of the moonbeast is a horrifying sight to behold. It’s slippery body can change size in an instant. Deadly claws and a blunt snout of teeth surrounded by tentacles complete this aberration’s bestial appearance. Many are fooled by this ferocious look and find out too late that a moonbeast is far smarter and more devious than it seems. Greedy Slavers. Moonbeasts covet gold. They hatch all manner of villainous schemes to get their claws on the stuff but their most profitable industry is slavery. Their greed drives them to sell any prisoners to others aberrations. Any humanoids defeated at the hands of a moonbeast who live eventually end up serving an aberration master – a fate far worse than death. Horrific Travelers. Moonbeasts will often use their own slaves or shapeshifting aberrations to help them travel with their slave cargo from place to place. They can easily change their size and shape to hide amongst the cargo holds of ships, wagons, and other vehicles while they telepathically dole out orders. Amorphous. The moonbeast can move through a space as narrow as 1 inch wide without squeezing. Horrifying Visage. Creatures who start their turns within 30 feet of the moonbeast and can see the creature must succeed on a DC 18 Wisdom saving throw or become frightened of the moonbeast for 1 minute. A creature can repeat the saving throw at the end of each of its turns, ending the effect on itself on a success. If a creature’s saving throw is successful or the effect ends for it, the creature is immune to the moonbeast’s Horrifying Visage for the next 24 hours. Magic Resistance. The moonbeast has advantage on saving throws against spells and other magical effects. Magic Weapons. The moonbeast’s weapon attacks are magical. Quickened Enlarge/Reduce. As a bonus action the moonbeast can cast enlarge/reduce on itself. The moonbeast does not require concentration to maintain this spell. Spellcasting. The moonbeast’s spellcasting ability is Intelligence (spell save DC 20, +12 to hit with spell attacks). It can innately cast the following spells, requiring no material components. Multiattack. The moonbeast can make one attack with its claws, one attack with its tentacles, and one attack with its bite. Tentacles. Melee Weapon Attack: +13 to hit, reach 15 ft., one target. Hit: 14 (2d6 + 7) bludgeoning damage and the target is grappled (escape DC 21) and pulled adjacent to the moonbeast. Until the grapple ends the target is restrained and the moonbeast cannot use its tentacles against another target. Until the grapple ends the target must succeed on a DC 20 Constitution saving throw at the start of its turns or suffer a level of exhaustion. Healing Consumption. The moonbeast eats an adjacent Small or Medium unconscious creature. When the creature is consumed, it dies and its body and all of its nonmagical possessions are devoured by the moonbeast. The moonbeast regains 50 hit points.